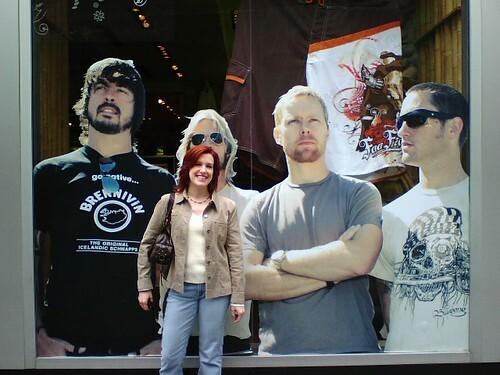 Yesterday Ozzie and I were walking through Times Square, when I saw my beloved Foo Fighters, larger than life, on the front window of the Billabong store. Looks like they've licensed the Foo name for merchandise. Sigh. Just the sight of Dave makes my heart skip a beat... still. I asked Ozzie to snap a picture of me in front of the window with my camera phone. "Don't you have enough pictures WITH Dave?" he asked. Maybe. But the odds of me ever being in his presence again are slim... LOL I take what I can get.